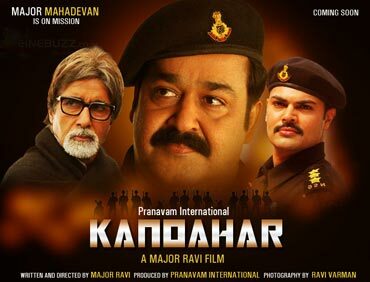 Meghna George reviews the Malayalam movie Kandahar. Post YOUR reviews here! Welcome back, Major Mahadevan! Mohanlal's much admired friendly Army officer character is now a top commando. He is back for the third time on screen fighting terrorists after they hijack a plane in Kandahar. The first installment in the series, Keerthichakra, has been more appreciated than the second episode, Kurukshetra. Though Kandahar is about the hijacking of an Air India flight by a few terrorists with the support of the Taliban, the story loses its way at several junctures. As a result, the sentimental scenes get more prominence at the cost of the action sequences, which is not a problem if the story is poised in such a way. But the narration is a topsy-turvy ride and as a result, even the sequences involving Major Mahadevan lacks definite punch. But the honesty with which Mohanlal has performed the role makes up for the shortcomings. Also, the film succeeds in instilling feelings of patriotism in the audience. However, the highlight of the film is the presence of legendary actor Amitabh Bachchan, for the first time in Malayalam cinema. It is a full-fledged role for Big B, as a retired school teacher Lokanath Sharma, who is married to a Malayali woman. Yesteryear heroine Sumalatha plays his wife and Tamil actor Ganesh Venkitaraman plays his son, Sooryanath Sharma. Amitabh Bachchan has done his part quite elegantly. His character is a man of principles, but the question is whether the role needed to have so much prominence. There is an attempt to link some storylines which happen simultaneously. Soorya is a hot-blooded youth and of course, his father has all his hopes pinned on him. A chance meeting with Major Mahadevan results in Soorya joining the Army. He undergoes rigorous training under Major Shiva, played by writer-director Major Ravi himself. Ganesh Venkitaraman comes up with a decent performance in his role as Sooryanath Sharma. While Soorya is training to be an Army officer, we are shown terrorists training in Afghanistan. The recruits for the jihad include a young lad, the only son of a poor Muslim lady, played by veteran actor KPAC Lalitha. Here the rather ordinary settings come in the way, especially during the final moments, when things just go haywire. A better script would have perhaps made the return of Major Mahadevan more appealing.